Filipino cultural assimilation is in full force as we ask ourselves the biggest question yet: are we going to purchase, drive, and care for our very own moped for the next 11 months? The other 5 people drive a scooter or motorcycle or bike taxi. I could get to the grocery store and back in less than 3 hours. We could drive to the mall. Beep beep. I would no longer need to squish myself onto the bench/laps of people on the Jeepney. My shoes wouldn’t have “mud” all over them. It will be the coolest thing I’ve ever done. I wouldn’t have to decide what to say/who to look at/where to hide/what facial expression to use when people shout friendly things at me while I’m walking home. Social stress. I wouldn’t have to see dead cats on the road while walking home. I wouldn’t have to walk, period. Fights over who gets to drive it. #3 was a lie because I would obviously not drive – the traffic situation here is similar to a blindfolded three ring circus, and the last thing anyone needs is me pretending to know what I’m doing, on a moped, weaving in and out between roosters and Jeepneys and stray dogs. Which goes back to #1. You came together so fast and I was talking so much about mopeds that I almost forgot you existed. But then I smelled your delicious coconutiness and saw your creamy, spicy sauce that reminded me of a delicious mashup of Indian curry and Thai curry… And then I shared you with the world, because maybe someone else likes 5 ingredient recipes as much as I do. This 5-ingredient coconut curry has broccoli and chickpeas and a creamy coconut curry sauce that comes together super fast. Dear wise reader, please tell us to get a moped. Love 5 ingredient meals, we had something very similar for dinner last night! I’m not sure about the moped but I know they are very popular and probably much safer than a motorcycle. I do know that your curry looks amazing and I can’t wait to make my own batch! I love all your posts from afar, especially the pictures when you can take them. Oh man, just look at that heaping spoonful of curry! And it only involves 5 ingredients?! Yes, please! Moped it up! Mopeding around seems like such a fun and easy way of getting around. I wish we mopeded more in the states 😉 Your curry looks deeeelish! 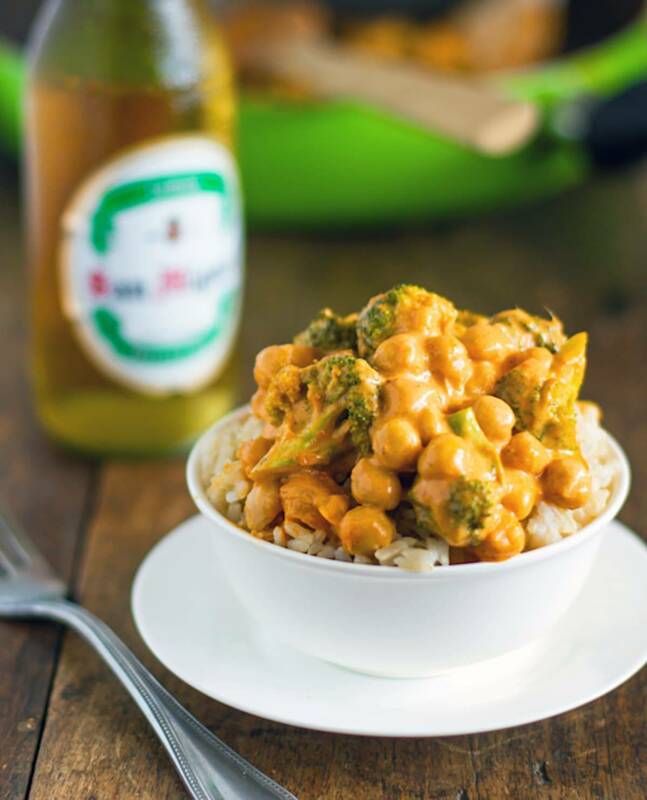 Chickpeas and broccoli in my curry sound magnificent! I mean, how many other chances in life are you going to get to own + drive a moped!? I was one of those confused reader…especially when I skipped over your explanation. Ah skimming….I think you guys should get one if only for the not seeing dead cats factor. I’m assuming this has happened more than once. I also think you definitely shouldn’t drive it…although maybe you’ll feel more comfortable in 6 months! Yes, more than once for the cats, unfortunately. RIP Kitties. I addicted to Thai curry. I need to join a 12-step program. I’m making this!! Yes to moped. I ride one. Our speed limit is 35k here and I find it convenient to ride. Wear a helmet when you ride and be alert and you will be fine. And of course you need mopeds. Hi Julie! Sorry to hear that. Tofu can be pretty bland depending on how you prep and cook it, so that could have contributed to the dish overall being a little bland. If you give it another try, you could add a little more curry paste! We all know that the tofu takes on the taste of what it is cooked in, not the other way around. Me thinks it needed some extra seasoning. Did you ever try it again? definitely needed salt or something added to it. Mine tasted pretty bland and I followed the recipe exactly (except I added more curry paste). Team Moped over here! Also considering Team Helmet, which requires a whole another pro/con list (death vs. extra soggy head situation). Get the moped for sure! Definitely go for the moped. Moped = quicker grocery trips = more recipes for us to read! I like your thinking John. Clever. Think about the sun and the rain before you choose moped. Me personally I would rather buy a small 4-wheeler and then sell it when I leave the place. That better handles the weather and the groceries and stuff. Plus you don’t have to wear a helmet. I’m sure you can get a good one for P150,000 or even less, that will be a good investment IMO. 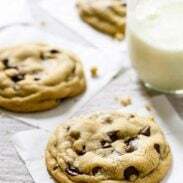 Mmmm so yummy!! Love this! Sounds like quite the list of pros and cons! 😉 This curry sounds amazing!! I love how easy it is! Well, I particularly wouldn’t want you to have to see dead cats on your way to or from anywhere. I hope they weren’t killed by mopeds. That doesn’t make it any easier for your decision, does it? 🙂 Also just wanted you to know I really appreciate receiving news of what you’re doing, hearing your thoughts – and I’m really glad you have found ways to cook. That’s a tough decision especially when number one con is death. Maybe spend the money on a few pairs of shoes that you can get muddy, carry large bags so people have to move away from you on the Jeepney and wear earphones when walking so that people don’t try to talk to you? Please get a moped! The thought of you being harassed, on a muddy(!) road, while looking at dead cats, on a 3 hour round trip just to go to the grocery store is not acceptable! Haha! Yes! The truth is, I’m not sure what’s more dangerous – moped riding or walking! my husband bought a moped while we lived on Guam! We would do “moped gang” group rides 😀 if you go for it…1. be careful in the rain!!!! A lot of roads are paved with crushed coral which = VERY slippery. 2. get a helmet with visor or goggles for sure. Have fun!! Guam? Moped gang? You are cool. I love how simple this recipe is and how quickly it comes together! It looks amazing too- can’t wait to try it! OK, seriously, it’s just a motorized bike. Scooters are only slightly more “dangerous” and WAY LESS dangerous than a motorcycle. Then again, it could become a “gateway drug” OOPS! I mean gateway FUN! hahahaha. Go ahead and get one. Your description of traffic reminds me of when I went to China. We were all convinced these drivers were insane–until we realized there were VERY FEW accidents and that because they had to be alert at all times, they are BETTER drivers than we are in our big cities. Think about it–how many times have you pulled up next to a driver who seemed catatonic and not really paying attention to the road? Or texting, or on a cell phone? Try driving through the streets yourself. You might be surprised at your improved driving skills when you get back to the states!